You may also want colored sugar, red and green gel icing or other decorations for your Christmas cookies. Take your sugar cookie dough out of the refrigerator while you're preparing the cookie paint. To make the cookie paint, separate the eggs, and place the egg yolks in a measuring cup. Beat corn syrup, water and egg yolks together until smooth and thick. Mixing your egg yolk cookie paint in this container will make it easy to pour into the mini muffin tins to mix your colors. 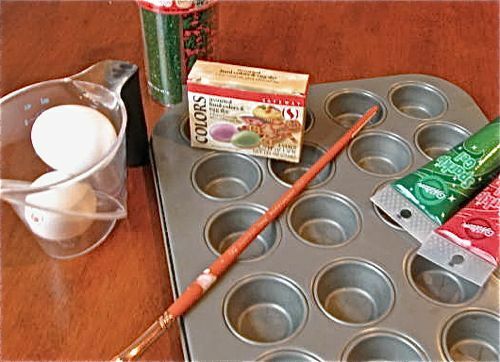 Pour the egg yolk cookie paint mixture into 3-5 mini muffin tin compartments, depending on how many colors you want to use to paint the cookies. In other words, if you want to have red, green and blue cookie paint, you will need to divide the egg yolk mixture among 3 mini muffin tins. If you want red, green, blue and purple, divide the egg yolk cookie paint mixture among 4 mini muffin tins and so on. Add 4-10 drops of food coloring to make each color of the cookie paint. Now you will need to roll out the sugar cookie dough. To make it easy to roll the cookie dough without sticking, place the cookie dough on a sheet of parchment paper. Place a sheet of plastic wrap on top, and roll the cookie dough to a thickness of 1/4-inch. Remove the plastic wrap, dip cookie cutters in flour, and cut out desired shapes. This is kids' favorite part! Dip the clean (never used) paint brush in one of the cookie paint colors, and spread the cookie paint on the cookies. You'll want to sort of dollop the paint on, so the colors appear rather thick and uniform. But do not saturate the cookies with paint. Decorating Sugar Cookies with Cookie Paint Step 7 - Eat the Cookies!